Valve has announced the registration and roster lock time period for the winter Major season to begin November 22nd, the day following the conclusion of The Frankfurt Major. The registration will take place from November 22nd until December 8th before the rosters are locked for the Winter Major. The Frankfurt Major has yet to begin and Valve has already announced the dates for the winter season registration time, taking place from November 22nd-December 8th. Two areas that have been updated to the original registration release is that all teams must re-register with their full roster again, even if they have made no changes and clarified the point that teams that go through the open qualifiers can still utilize their two substitute players for the main event and regional qualifiers. To be considered for an invitation, all teams must first register at the website. Teams will have the option to register both active members and substitutes. All teams will need to sign up to eligible for an invitation. 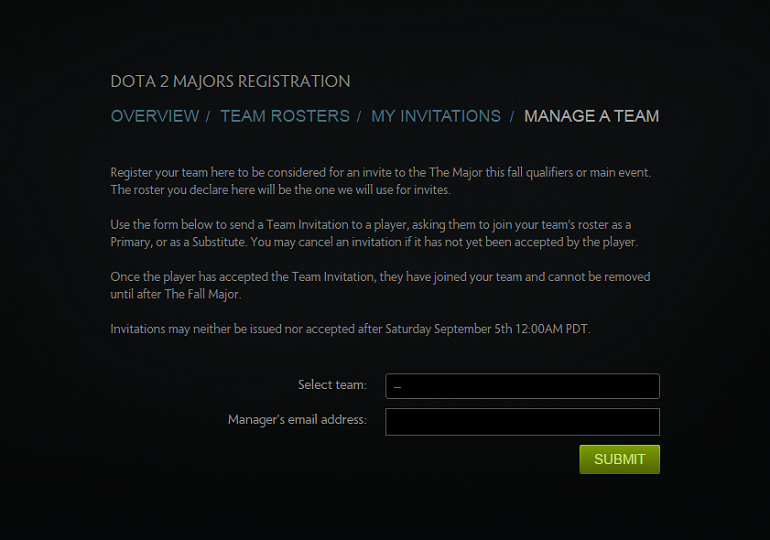 The roster that is created through this process is the one that will be considered official by Valve. The registration form will allow the manager to invite the team members and manage the team roster. Players will be able to accept, decline and view their invitations to teams as either a primary member or substitute. 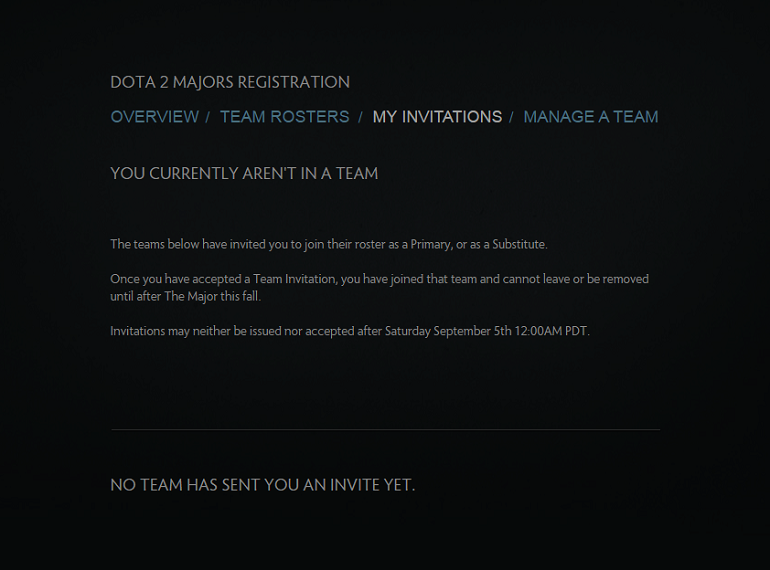 Once a player has accepted a Team Invitation, they become part of the official roster and changes, such as leaving and removal, can not be made until after the first Major. Invitations may neither be issued nor accepted after Saturday December 8th 12:00AM PDT. Players and fans are able to search for a team to obtain a list of registered players. All rosters are made public as soon as a player accepts the invitation. Valve has provided answers to some of the most commonly asked questions regarding the roster lock, roster invitations and the impact on the invitation to participate in the first Major. UPDATED: I REGISTERED MY TEAM FOR LAST SEASON. DO I NEED TO REGISTER IT AGAIN?Yes, everyone needs to do the registration again. Each trade window sets a clean slate and all teams need to confirm their players again. That way players can opt to lock to different teams and teams can opt to lock new players. HOW DOES A PLAYER BECOME LOCKED TO A TEAM?First, the administrator of a team issues either Primary Member invites or Substitute invites to players. Then these players can review their invites and choose to accept one of them. Once they’ve done so, the player is a confirmed member of the Pro Team and is locked until prior to the next trade period. WHAT DOES BEING LOCKED TO A TEAM MEAN? While a player is locked to a team, the team cannot kick the player, and the player cannot leave the team. CAN A PRO TEAM INVITE BE RESCINDED? Yes, but only if the player has not accepted it yet. Once a player accepts an invitation, the player cannot be removed from the team. CAN A PLAYER BE INVITED TO MORE THAN ONE PRO TEAM?Yes, but they may only accept one of those invites. WHAT’S THE DIFFERENCE BETWEEN A PRIMARY AND SUBSTITUTE INVITE? Players who are in Primary slots are the ones who receive invites to the Major. SO HOW ARE SUBSTITUTES USED THEN? CAN THEY BECOME PRIMARY MEMBERS? Yes – in order to swap Primary and Substitute slots, both the Primary and Substitute players must agree to the swap. UPDATED: WHEN WILL ROSTERS BE LOCKED? Rosters will be locked on December 8th 2015 12:00AM PDT. WHAT IF WE NEED TO MAKE ROSTER CHANGES AFTER THE LOCK? Making changes to your roster will cause your team to no longer be eligible to receive a direct invitation to either the Major or the Regional Qualifiers. Note that this only applies to roster changes outside of your Primary and Substitute members — there is no penalty for swapping between Primary and Substitute slots. Your team may still register and participate in the Open Qualifiers. WHAT IF WE NEED TO CHANGE SPONSORS OR JOIN A TEAM ORGANIZATION? We have no restrictions on what organization or sponsor the team is part of, that is up to the arrangement between the players and the organization. 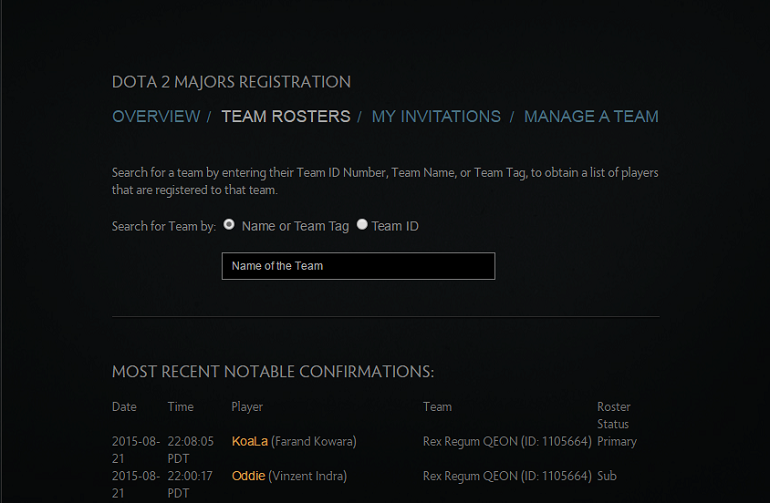 The roster lock date only imposes the requirement that the registered set of players remain together. UPDATED: WHAT HAPPENS TO PENDING INVITES AFTER DECEMBER 8th? At that time, all pending invites will be canceled. DO WE NEED TO UPDATE OUR IN-CLIENT TEAMS BEFORE THE DEADLINE AS WELL? No, we will automatically update the in-client teams for you after the roster lock on December 8th. UPDATED: WHEN WILL PLAYERS BECOME UNLOCKED AGAIN? Players and teams are locked through the Major this winter. After its conclusion, players will unlock from their teams and the process begins again. Teams will again need to invite all their players, and players will need to accept an invite. This is true for all players, including those that intend to stay with the same team. This lock period only lasts until the end of the Major this Winter. After that, there will be another trade window which will be the last one until after The International 2016. WHAT INFORMATION IS PUBLICLY VISIBLE? Invites are private, and can only be seen by the inviter and invitee. Once a player has locked to a team, that lock is made public. NEW: CAN TEAMS GOING THROUGH OPEN QUALIFIERS HAVE SUBSTITUTES? Teams participating in the Open Qualifiers will be able to register up to 2 subs when they sign up for the tournament. They will still only be able to use the main 5 players during Open and eventually Regional Qualifiers, but they can have the subs available if needed for the Main event.